One-page website design is getting bigger and bigger. It is due to its simplicity, ease of navigation and ease of access that this web design trend is an excellent solution for different types of websites. Is one-page website design right for my business? Although this type of web design is suitable for a large number of projects and businesses, it doesn’t mean that it is the solution that covers all purposes. Having a single page website is great because it is not loaded with content and the user doesn’t have to jump from one page to another to get the whole picture and content. Now that we’ve identified the type of websites this web design solution can be applied to, it is time to get your hands into creating the layout for your future single page website. It is good to know that there are a lot of free website templates and WordPress themes, from which you can choose the one that best suits your purpose and needs. Creative template suits perfectly small businesses. It offers a clear style and seamless experience for the user. And it can easily be optimized and customized to fit the business needs. Agency is another one-page website template focuses on providing a web design solution to small businesses and agencies projects. Those who want to use the template to promote their portfolio will find the popup preview function which is a functional option to let people know about their past experiences. Read 7 Landing Page Conversion Best Practices to create a landing page that will bring you prospects. This theme is great for those who want to promote their freelance skills and get freelance gigs. The good thing is that the theme is optimized for all devices, which means a responsive experience across any screen size. Less is more and Grayscale theme is here to prove it. It provides the solution for any business that wants to promote itself without the extra effort. One Page Wonder free one-page website template is the best for practicing Bootstrap and front-end web development. If you’re up for a one-page design for your online project, simplicity is the key to making it work. Although not easy to fit all the information into a limited space, single page designs are very successful and even have gained popularity among web designers. Before making it live, make sure you know the message you want to send, the content is short and to the point and the text is readable. Avoid clutter, as it will tire the users and will make them leave your website fast. Read also What Makes a Good Web Design: 8 Essential Elements. Make sure you include the most important content. To be more specific, focus on answering in the content you display on the website to the following question: “How does this benefit me?” People are now very picky and if they don’t get the answer to the question, they will find someone who will. Grab the attention of your website visitors with outstanding pictures, layout, fonts and white space. Also, the colors that dominate your website must be in coordination with your business image. Navigation is the tool that guides people to where they need to go for information. For a one-page website design, the navigation must be clean and easy to use. Today, all websites must be responsive. Think about the multitude of screen sizes and devices people use to surf the internet. Think about their experience when using your website and make it enjoyable. 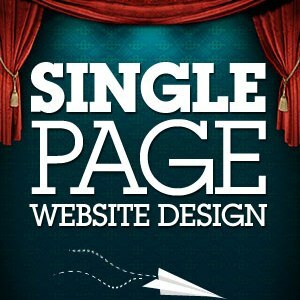 To sum up, one-page website design gains popularity. So why not benefitting from this and designing outstanding, simple but informative websites that will focus on the main message you want to send to your customers? Copyright © 2015 DesArt Lab Limited Liability Partnership. All rights reserved.